Necklaces have been an integral part of jewellery since the time of ancient civilizations. 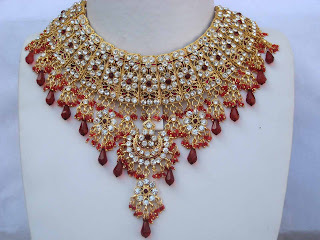 A necklace is an article of jewellery which worns around the neck. Necklaces are frequently formed from a metal jewellery chain. It is a classical piece of jewelry, considered by many to be a must have piece for all women of distinction. Necklaces are popular among all ages, cultures and gender. The oldest necklaces were made of purely natural materials. In the modern era, a variety of new metals are available for necklaces that earlier generations could not properly melt until high-temperature were developed, such as stainless steel and titanium.